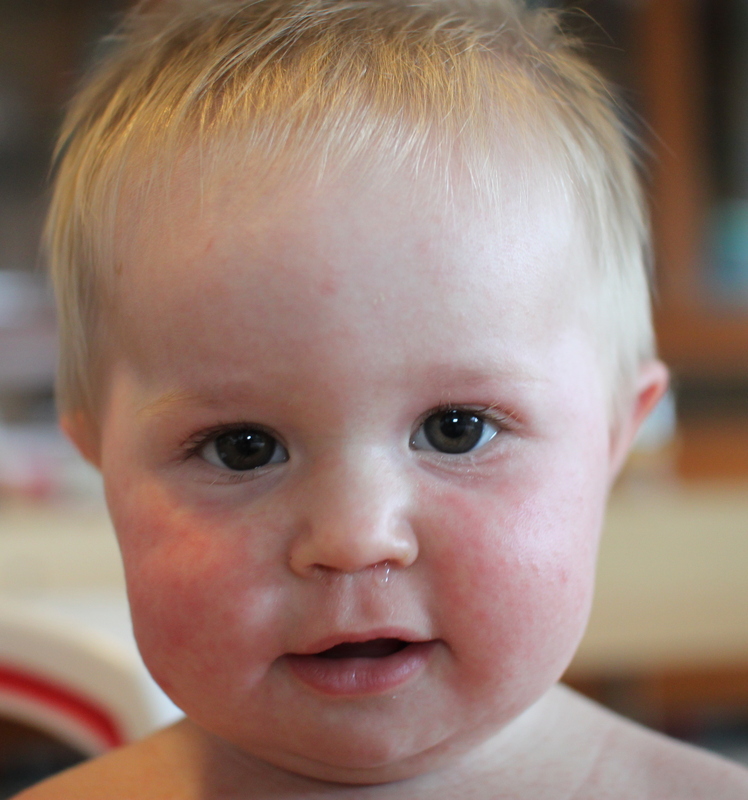 We had an unwanted visitor in our house two weeks ago: roseola. Three days/nights of high fever ranging from 103-105 degrees Fahrenheit, followed by a full body rash. Not fun for little ones, mommies, or daddies. I wanted to share these pictures of Kate because I know that roseola is a scary thing for first time parents. High fevers always make me nervous and the rash looks pretty awful. 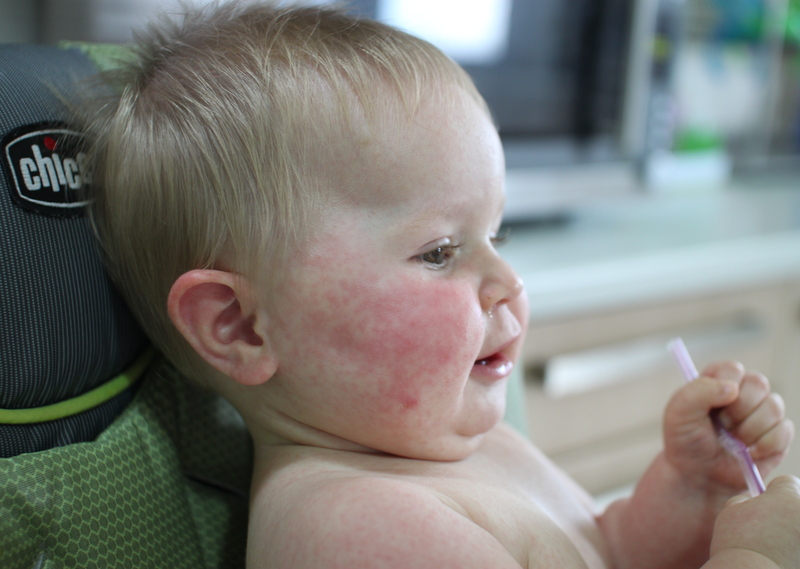 The thing to remember about roseola is that it is extremely common viral infection in young children (both Logan and Katelyn had it around nine or ten months of age) and will usually only last a few days. It typically starts with a sudden high fever, followed by a rash that usually appears on the trunk, torso, neck, and arms (both my children also had it on their face and legs). While there is not much you can do to treat it, bring the high fever down with frequent sponge baths and infant acetaminophen and/or ibuprofen. The rash is not itchy and although it looks bad enough to leave scars, I promise that it doesn’t. It fades away fairly quickly after the fever has subsided. Other than that, give them lots of love and care. With such a high fever, they won’t be sleeping much and they won’t have much of an appetite either. So, when this happens to your sweet baby, know that it is common and will only last for a short period of time. Here are some resources that will tell you more. Poor baby! But, she is still so sweet!!!! Thanks for posting these photos. My daughter is going through the rash part now, after two trips to the doctor with the high fever! She has the rash on her face, something the doctor didn’t warn about (and isn’t in most photos / descriptions online). I feel better seeing it’s a “normal” part of this! Thanks for sharing these photos. 🙂 You are a good Mom! Thank you for sharing this, our little one, 10 m/old, is also going through it and your post helped us feel better about it. Much love from Oakland California! Of course. It can be such a scary thing with the high temperatures and rash, but when you’ve been through it at least once, you realize that it is not as bad as it seems. Hang in there. Love from Washington, D.C. (with a move to Krakow, Poland just around the corner)!